Gathering My Roses: ZeroWater -- Review and Giveaway -- ends 2/15/10! CONTEST CLOSED! ZeroWater -- Review and Giveaway -- ends 2/15/10! CONTEST CLOSED! I admit, I was fairly skeptical. I didn't expect a water pitcher with a filter to really clean my tap water and improve the taste. with the accompanying ZeroWater ZT-2 Electronic Water Tester, and Filter Cartridge. The pitcher is wonderful. 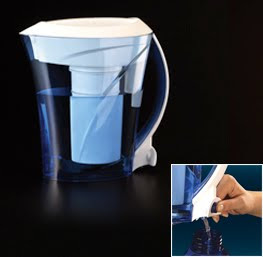 Not only is the pitcher quite pretty, it has a snap-on lid to prevent spills, pouring spout and an exclusive in-fridge push button dispenser! I love the convenience this brings to me! The directions were simple and written clearly. I had no trouble putting the unit together. ZeroWater is amazing. I followed the instructions and waited for my first pitcher of clean, filtered water to appear. I won't have to go out and buy bottled water anymore! At almost $6.00 per case of water, at 2 cases per week and 52 weeks a year -- that's a savings of a whopping $624.00 per year! The ZeroWater Pitcher retails for approx. $35.00. That's 6 cases or 3 weeks worth of bottled water! So, it pays for itself in less than a month! The best part, aside from the purity and great taste, is that it reduces the numbers of plastic bottles going into landfills to last forever. From the Website: ZeroWater® is the ONLY filtered water that meets FDA definition for purified bottled water. The ZeroWater Filter was developed in the early 1990's. As of 2008, ZeroWater holds 4 patents regarding our filters with additional patents pending. ZeroWater offers the Filter Bottle, Filters, Pitcher, and Accessories. ZeroWater is deeply concerned about the environment and it's own impact upon it. They encourage their customers to particpate in a Filter Recycling Program through their website. When you mail in your used filters, you'll receive a $5.00 coupon for a future purchase of ZeroWater filters. How great is that? This company doesn't just talk the talk -- it walks the walk! Refreshing! You can purchase ZeroWater products at Target (and Target.com), WalMart, Home Depot, and Walgreens! You may also register your ZeroWater purchases on line at the website and you may be offered the chance to participate in and join the product development team! The wonderful folks at ZeroWater have generously provided for one lucky Gathering My Roses Reader a ZeroWater Pitcher of their very own! Just follow the entry instructions below! Each comment gives you an extra entry into the contest. Go to ZeroWater FAQ Page and, using the menu there, tell me two things about ZeroWater that you've learned. 2. Make a ZeroWater Purchase. 3. Follow me @GeorgiaMist on Twitter. 4. Publicly follow me on Google Friend Connect (located on the sidebar). 5. Join our Gathering Roses Facebook page (on the sidebar). 6. Tweet this contest daily and leave a comment with your Twitter status each day. This contest will be open from Tuesday, February 2nd until Monday, February 15th. Winner will be announced on Tuesday, February 16th. The ZeroWater Pitcher will be shipped directly to the winner by the ZeroWater Company. DISCLAIMER: I received a ZeroWater Pitcher for the purpose of review. I received no monetary compensation. My opinion is based on personal use and experience. I learned that ZeroWater filters produce the only filtered water that meets the FDA definition for purified bottled water...and second, they started the first recycling program in the U.S. among leading pitcher manufacturers. A. As of 2008, ZeroWater holds 4 patents regarding our filters with additional patents pending. I went to their FAQ and learned that they're the first to start a recycling program in the US among leading pitcher manufacturers. Also, they have a 90 warranty for the pitcher and 30 days for the filter. I learned that each filter is good for 22.5 gallons--but results vary and some found it worked for 30 gallons. I also learned that the TDS meter will tell you when you need to change your filter it will read 006. I learned that zero water meets the definition of purified bottled water (without all the waste) and that it removes 100% of all detectable dissolved solids-very cool. 2) The pitcher includes "one Pitcher, one filter, and one TDS meter." The meter tests the water and gives a digital reading. I learned it was created in the early 1990s and its the ONLY filtered water that meets the FDA definition of purified bottled water. i learned that they were first developed in the early 1990's and they are certified by nsf international and the water quality association. im surprised that the filter was made in 1990!! 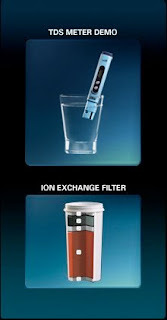 Zero water filter was developed in the 1990's. It was patented in 2008 and currently holds 4 parents. Thank you for a chance and I am following you at twitter too! I learned that Zero Water Filters are 5 stage filters and that the filters are certified to last for 22.5 gallons per filter. Learned-A. Though we are lab-certified for 22.5 gallons per filter under the strictest conditions. The tester empowers you to compare various water sources. 2. Removes 100% of all detectable dissolved solids. I follow you publicly with Google Friend. Hi! I fanned ZeroWater's Facebook page and left a comment. i signed up for coupons! 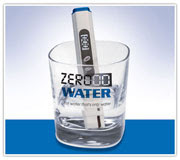 Zero water was developed in the early 1990s and holds 4 patents. 1. The filter was developed in the early 1990's. I follow me @GeorgiaMist on Twitter.